Maple turning wood tends to have cream sapwood; the heartwood is tan colored. 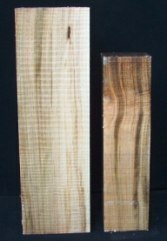 Some blanks have spalting and or ambrosia lines. The wood is usually straight grained. Maple is a good turning wood that sands to a beautiful tight finish. Bowl blank measurements are in inches, diameter x height.